New York fashion week started with a bang. Determined to re-write Africa's story, five designers by way of Lagos and London lit up the New York catwalk in the Arise African Icons tent with chic women's and menswear designs. If you thought African fashion was just the odd Accra printed skirt, you couldn't be more wrong. Popular established designers such as Ozwald Boateng, showed alongside new talent such as Maki Oh, who is already garnering stellar reviews from the New York fashion press. The runway show was all about glamour, with African prints reworked and updated for the spring season, stunning silk and lace womenswear designs and show stopping, floor-length cocktail dresses – proving what African designers have long been saying – they are more than just their prints, but when they do a print, boy, do they do it well. The clothes weren't the only attraction, either. The models transformed the runway, thanks to the spectrum of shades. Black and Asian models stomped down the catwalk in droves, celebrating the different hues of black skin, often under-represented at most other shows in the tents. 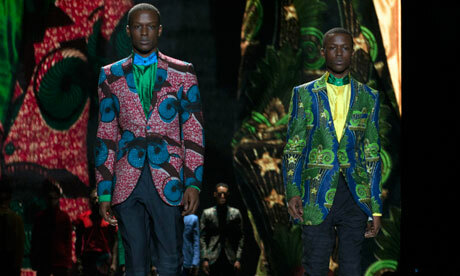 For those of you who didn't get a front-row ticket to the Arise show, here are the African Icons spring 2013 designers you need to know. Long before menswear started to have its moment, Boateng was championing the fit of a good suit. From his Savile Row shop, the British designer of Ghanaian descent, made history as the first black tailor to have a shop on the Row. Over his 25-year career, he's become the go-to designer for Hollywood and the man on the street who wants to look sharp. Yesterday, Boateng's collection lit up the runway. It was saved until last and for good reason. His men's suits, in an array of spring colours, from bright red to canary yellow –showed that the suit can looked playful – and there's room for it beyond the boardroom. While the selection of double-breasted jackets and macs, which fitted the models perfectly, proved there's more to the designer than just his trademark suits. With her first New York fashion week show, this 26-year-old Nigerian designer, who is based in Lagos, is already making waves. Featured in the Cut this week, and with a designer of the year gong already in her pocket, not to mention the odd celebrity fan (hello Solange Knowles) Maki Oh is definitely a face to watch for 2013. The designer, whose first career choice was to be a dancer, captivated the runway with designs celebrating the female form and sensuality – think high waisted, knee-length skirts cinched at the waist. Prints, tassels and textures from red velvet to silk were all about celebrating the Maki Oh woman, who Oh describes as "definitely a strong woman, aware of who she is and where she is coming from". Tiffany Amber's mission with her third New York fashion week collection, she says, was to right some fashion wrongs: "African prints have been demystified. It's gone from haute couture to high street." So she wanted to bring the glamour back. With her "rhythm of African" collection, the Lagos-based designer did just that. Bold colours and prints (featuring African musicians) dominated the runway; with sheer, floor-length dresses to jumpsuits – perfect for the working woman who is looking for an extra dimension to her daywear. This South Africa-born designer brought the fantasy element of fashion back to the runway with creations that were eclectic and high glamour. The models wore metallic visors that resembled crowns, while the dresses in shades of bright prink to gold, dazzled the runway and emulated the Ice Queen in Snow White. The more wearable pieces were a delight, such as the long sleeve, lace, fitted dresses to the knee in white with gold detailing, which had a vintage feel. Tsemaye Binitie hails from Nigeria but is based in the UK and after stints at Burberry and Stella McCartney, he set about creating his own contemporary womenswear label. With his sister (who helps runs the company) as a muse for his designs, the runway show was awash with structured silk dresses, in light spring colours and deep reds, wearable leather trousers and peplum tops.